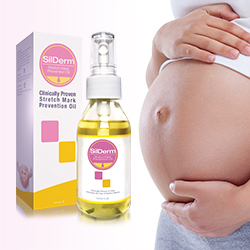 SilDerm® Stretch Mark Prevention Oil has been developed by medical professionals using the finest botanical extracts and ingredients clinically proven to prevent and reduce the formation of stretch marks during pregnancy (striae gravidarum). Motherhood is a joyous time and Moms are proud tigers that have earned their stripes. Still all the more reason you deserve to look radiant and feel beautiful during those bikini-beach days. Luxurious blend of vitamins, essential oils and botanical extracts rich in antioxidants such as Vitamin E, Gotu Kola (Centella asiatica), Prunus amygdalus dulcis (Sweet almond oil), Vitis vinifera (Grape) seed oil, Lavandula angustifolia (Lavender) oil, Theobroma cacao (Cocoa) seed butter & Helianthus annuus (Sunflower) seed oil. Lavender’s aromatherapeutic properties relax the mind to induce a calming experience. 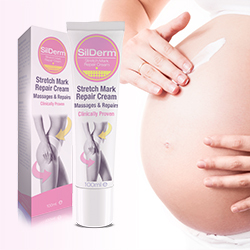 A study of 80 women showed that “the active component, Centella asiatica, induced significant prevention of stretch mark development,” stimulated “fibroblastic activity and combated glucocorticoids – a steroid hormone which in high levels is associated with stretch mark formation.